Bunn coffee server model number 36029.0001 will hold up to 64 ounces of hot coffee or tea. It is constructed of unbreakable stainless steel on both the interior and the exterior. You hot and cold beverages stay that way for hours in the vacuum insulated server. You can brew through the lid giving you direct brewing. This coffee server will fit on the Bunn thermal carafe and twin thermal carafe brewers. BUNN BCF100-B 100-Count Basket Filter. 100% pure virgin fiber in these home brewer filters. 100% biodegradable box and filters which are designed for eliminating overflow. This permanent filter will eliminate the need to keep buying paper filters along with no more throwing out messy used filters. These are easy to fill and insert in your coffee brewer, and come with a three year warranty. 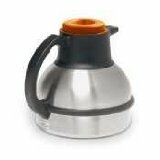 Pitcher for use with all 12-Cup commercial coffeemakers.